Dreamliner was always an allure for me and I happened to indulge in its luxury recently on Nairobi- Johannesburg route on Kenya Airways. Just as I had expected it was amazing! Right from some distinct luxuries to simply “ooh”(some) lighting, dreamliner was just that- A DREAM COME TRUE! Wait….we have a WARNING in the end, don’t miss it!! So what makes dreamliner so loved and talked about. It's the specs silly! The Dreamliner is a revolution in the history of aviation from the technical point of view. This two-engine, wide-body jet is comprised of 50% composite materials. Because of the design it is lighter, consumes less fuel and has a longer range. The composite design also introduced advanced solutions for increased flight comfort It is worth emphasizing the pressure inside the Dreamliner is 21% lower than standard airplanes .It also reduces the effect of the altitude sickness, dizziness and nausea, and combined with 8% more oxygen, higher humidity and better air filtration, it reduces the feeling of tiredness. The unique structure of the wings with elevated tips permits reduced air resistance. All of these solutions allow long-distance flights to proceed without additional turbulences and intermediate stops, while saving precious time for passengers. The Dreamliner is also environmentally friendly. The advanced Rolls Royce engines emit 60% less noise, and combined with Dreamliner's light structure – the fuel consumption is also smaller. This is why Boeing 787 could not have a better name than Dreamliner. For years, in-flight entertainment has literally bored me to death. Either I am not interested in what they are showing or I have seen it dozens of time. What can I say…I am a big TV and movie buff!! So naturally the first thing that caught my attention inside the plane was the USB port for charging phone which doubled up as flash drive reader. For me this meant carrying my own content to watch during the trip. Finally, a flight where I was not going to fly sleeping or reading or drinking myself to sleep! The screens are all touchscreens and not the usual kind that do not respond to touch. (Yep! lousy touchscreens on flights have happened with me). These babies looked good and felt even better. The best part-.my babies had their own favourite shows running while I had mine! The windows inside dreamliner were larger as compared to any similar sized airplane. Infct the windows are 30% larger than standard airplanes and allow passengers to see the horizon. Can there be anything more soothing during a sky flight? Instead of pulling shades up and down, one can adjust the brightness of windows with a button. You can turn windows from fully transparent to turning them completely dim which gives them bluish tint so there is no need to pull down the shades if it gets too sunny! This feature was so cool that my kids had a bonanza time. To my little one these windows were an entertainment in themselves and his expressions and resulting giggles were simply too cute and heart warming. Gets You In The Mood! 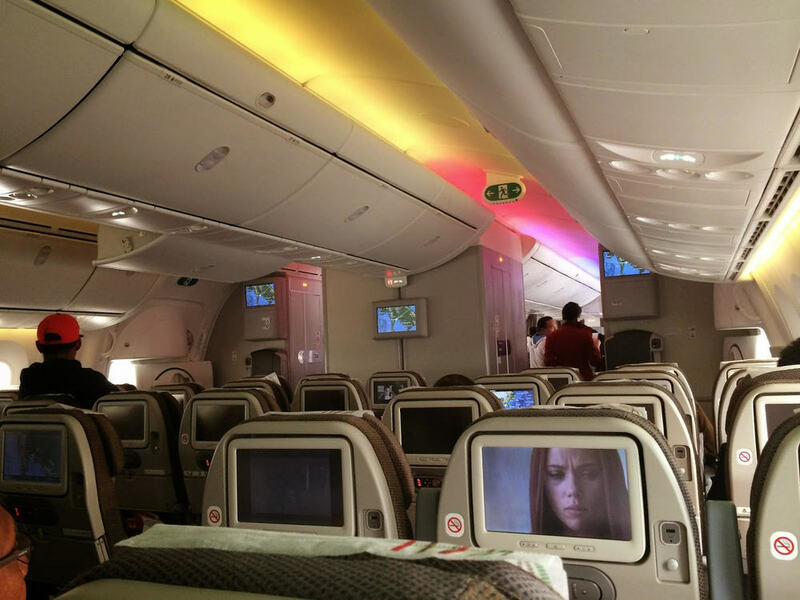 Dreamliner has fancy LED mood lighting schemes that include lavender light when fliers need to relax, and warm orange-tinted light during meal service. It makes the interior more comfortable and cosy. For those who have a thing for lighting (like me are sure to fall in love with the play of lights inside. The lighting also transforms the otherwise bland interiors of the plane. Again kids were delighted and could not agree on which light scheme was their favourite. After getting all wide eyed at the miracles happening inside the plane, it was time for some tummy pampering. We had almost forgotten that all of us were pretty hungry until the menu appeared and it looked great! We were fairly surprised by the spread of typical Indian delicacies like aloo paranthas (Indian bread stuffed with potatoes) with Paneer curry (Cottage cheese in gravy) and Rasamalai for dessert. 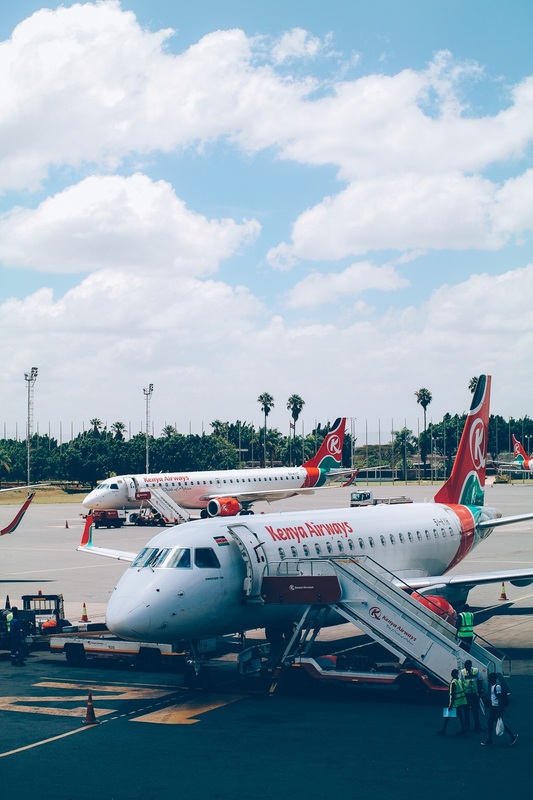 What actually made it remarkable was that this food was being served on Nairobi – Johannesburg route. I have rarely seen such a beautiful spread and authentic Indian meal while flying outside Indian sector. Think Before You Fly In A Dreamliner! All in all our flight on dreamliner really was out of a dream. It was spacious enough for passengers to move around in the cabin and had a good leg space. The only negative thing about flying in a dreamliner is that it SPOILS you. Now I and my kids are always looking at the next dreamliner ride and the usual planes are just not enough and up to mark for us! So if dreamliner is on your bucket list, tick it fast and take it from me you will not like flying on anything else thereafter! So let me take your leave and while you ponder whether you want to get spilt by this one heck of a plane or not, have a look at the many moods of the dreamliner below. So what you waiting for ? Go to our flight planner page right now and book your next flight in a dreamliner! Newer Post10 Helpful Tips You Need To Know Before Your Next Beach Vacation! Older Post10 Things That Make Camden Absolutely Extraordinary!